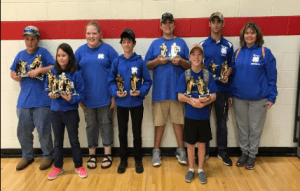 Twenty-seven Marshall County 4-H Sharp Shooter members competed in the 2017 State 4-H Shooting Sports Competition on Saturday, Sept. 9 in Wilmore and Sunday, Sept. 10 in Berea, KY. They were joined by more than 1,100 other 4-Hers from across Kentucky in this two-day shooting sports competition. Several Sharp Shooter members placed in the Top 10 in their respective disciplines. Marshall County 4-H Sharp Shooters – Carter Beliles, Colby Byars, Brody Chambers, Clay Cope, Tommie Crank, Gabby Davis, Will Davis, Wade Driver, Kelsey Littrell, Tanner Puckett, Lainee Siegle, Case Thomason, Morgan Westerfield, Cullen Wilson and Teddy Wynn – also participated in events during the State 4-H Shoot. The 4-Hers in Archery are coached by Chris Miller and Patrick Westerfield. Rifle Coaches are Perry Joe Thomason, Randy Irvan and Roger Oden. Pistol coaches are Adam Driver and Marty Barrett. And the Shotgun (Trap) Coaches include Kevin Smith, Chad Driskill and Lee Cope. Other volunteers who contribute to the club’s success include Missy Miller (County Coordinator), the 4-Hers’ parents and grandparents, and other family members. 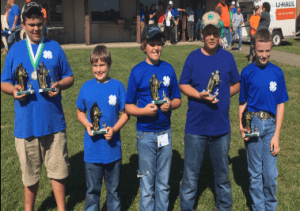 The Marshall County 4-H Sharp Shooters are winding down their year and will start again in January 2018. The group practices at the Calvert City Gun Club. The Sharp Shooters will send notices out to the schools and newspapers when they have their first meeting of the year planned for mid to late January. Marshall County youth between the ages of 9-18 and their parents will be welcome to attend the club’s informational meeting to learn more. To learn more about 4-H Youth Development programs, contact the Marshall County Extension Office at (270) 527-3285.